A branch of physics that is concerned with temperature and heat and their relation to energy and work is known as thermodynamics. An objective measure of hot or cold is known as temperature. The kinetic energy increases with the increase in temperature. The effect of increased molecular kinetic energy can only be measured using a thermometer. This instrument consists of a bulb, blown at the end of a glass tube. This bulb is filled with mercury or coloured alcohol and the other end is sealed. As liquids expand more than solids, heating the bulb causes the liquid inside to increase its molecular activity. This results in expansion and the liquid height rises up the bore which gives us the value. The standardised scale of degree used in thermometer is Celsius. Under normal conditions, ice melts at 0oC and pure water boils at 100oC under standard atmospheric pressure of 760mm of mercury. Fahrenheit scale is also in use in some cases, in which the fixed points are based on the freezing and boiling point of water made to 32oF and 212oF, respectively. The lowest possible temperature is -273.15oC, which is known as the absolute zero. Each division in Kelvin scale is same as Celsius scale, so that 0oC equals 273K and 100oC equals 373K. The conversions between the scales may be done by using the following equations. Heat is defined as an energy in transit, which only exists in case of energy inequality level. When heat flows from the hotter body to the colder one resulting in falling of the energy level of the hotter body and vice-versa. This heat flow continues until a state of equilibrium is reached. Specific heat capacity: It is defined as the amount of heat required to raise 1kg of a substance by 1oC, which is represented using the symbol ‘c’. The amount of heat needed to increase the temperature of 1kg of water and 1kg of steel is quite different. Copper requires less heat energy to reach the required temperature than aluminium. In case of gases, two values of specific heat capacity are considered, as the absorbed heat depends on the existing conditions at that time wither at constant pressure (cp) or at constant volume (cv). Heat transfer: Heat transfer takes place in three ways such as by conduction, convection and radiation. Mostly heat flow takes place as a combination of these methods. Conduction is a process by which heat is transmitted through collision of molecules. It is associated with substances whose molecules are tightly packed together. Heat increases the vibration which is transmitted to adjacent molecules by direct contact. The more closely packed the molecules, the better the conduction. Solids are better heat conductors than liquids and gases. Convection is a process by which heat is transferred as a result of molecular movement of gas. If these molecules come in contact with colder bodies, they emit heat energy by conduction. Radiation is a process of energy transmission or emission in the form of waves through empty space. No contact between the bodies is required for radiation to occur. The earth receives heat energy through empty space by radiation from the sun. The energy is transmitted in the form of electromagnetic waves travelling at 299,800km/s in empty space. 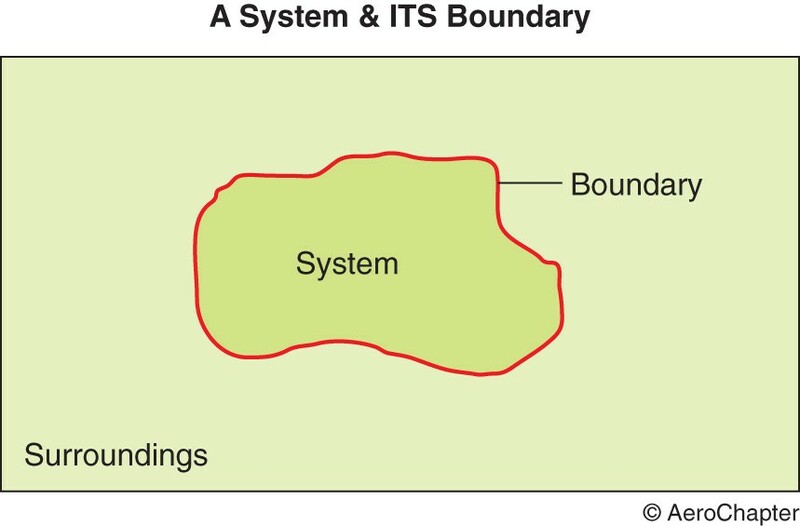 A system is defined as a collection of matter within prescribed and identifiable boundaries. It can be a person, an aircraft or a gas container. An aircraft inputs include fuel, air, oxygen, oils and greases, water, food and so on. Its outputs include heat, noise, gases and waste materials and so on. A closed system does not allow any transfer process to occur across its boundary. This system occurs with the closed piston and cylinder arrangement as shown in the figure below. The gas already possess some intrinsic energy before any heat is exchanged in the system. And no mass movement occurs into and out of the cylinder. The process of energy release as heat when a compound undergoes complete combustion with oxygen under standard conditions is known as the heat of combustion. A bomb calorimeter apparatus is used to determine the heat of combustion of a fuel.